Well summer was on the way and I had this spring project in mind for sometime. I wanted to get some shade cloth up for the back of the house. It all went well and the 4”x 4” posts went in and it was all looking good. As my neighbor was over for drinks, we were talking and the topic comes around to how are you going to paint those welds and the galvanised posts. See, his galvanised painting all came off 18 months after putting it on, then all the welds went rusty! He was not real happy about that. So, I figured ... here’s a good one for a Howie's How To. 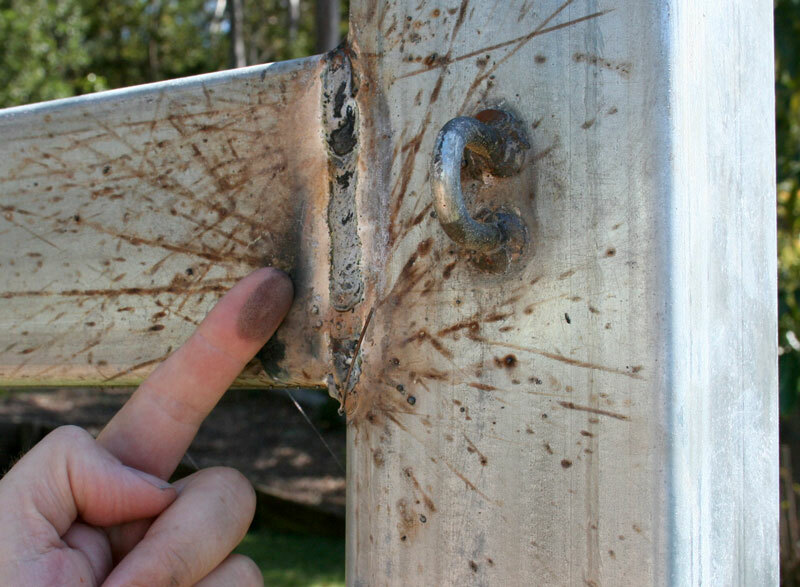 For the average person, galvanized surfaces and welds can be quite problematic. 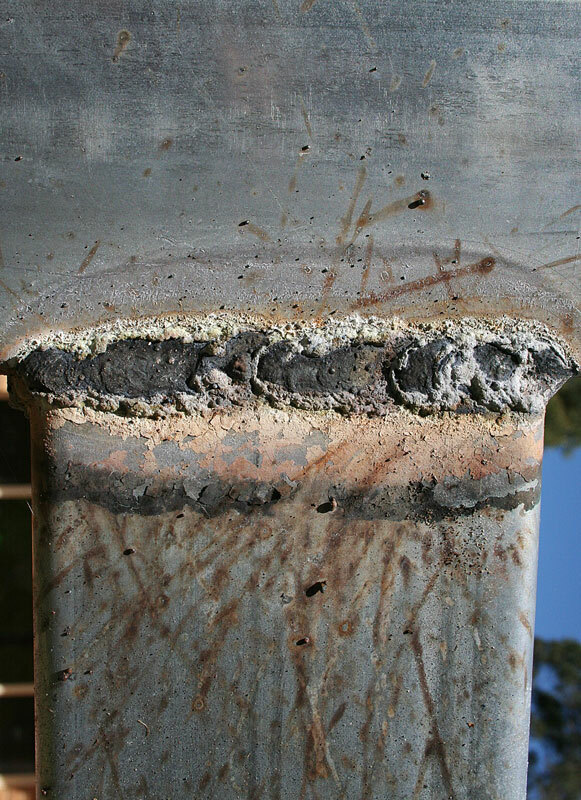 It is difficult to to find a product that both seals the welds and primes the galvanised. 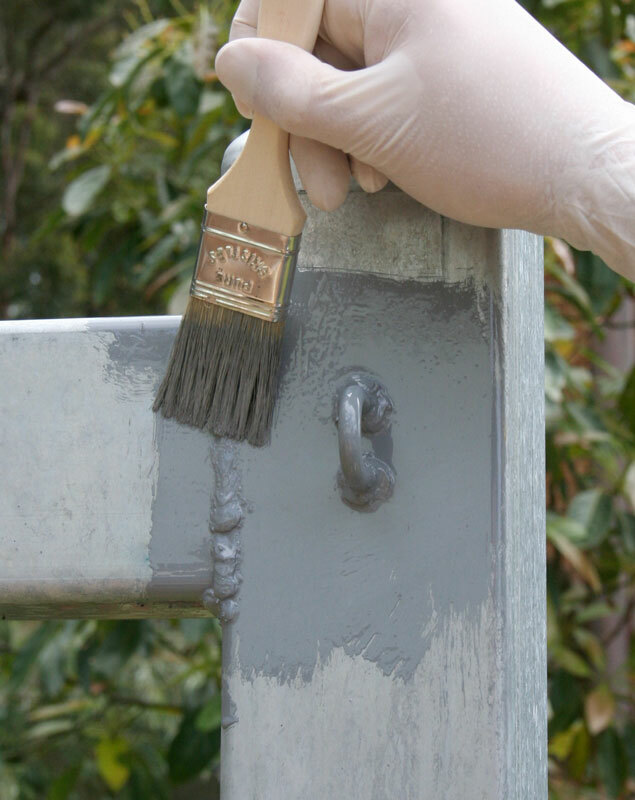 It is not easy and if you live near the coast you must get it right because even galvanised only lasts a few years unpainted before spot failure can occur. So let’s get started and it’s here were most people go wrong at the very first step. 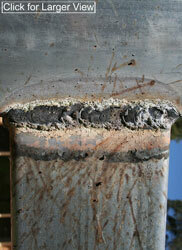 Firstly the weld is covered in carbon and other nasties you must clean it. 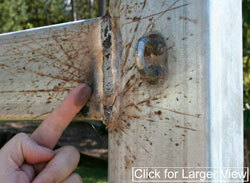 The other big mistake people make is thinking that the galvanized posts are clean. They are not! At many places where the steel is warehoused they put oil on the galvanized surface to stop it oxidizing and keep it looking new. No paint or etch is going to work unless you clean all of this off. 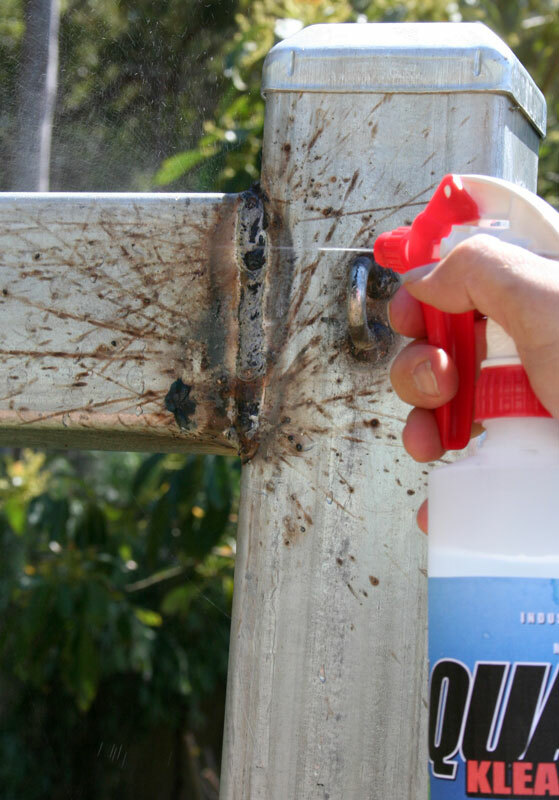 Some people use solvent cleaners, but the surface is still not clean enough for an etch or for painting. 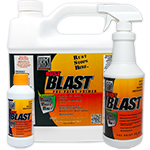 All I did was mix up some KBS Klean ... about 3 parts water and 1 part KBS Klean in a spray bottle and sprayed away. Many times I use really warm water, but water straight from the hose worked well for this project. 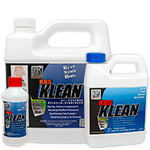 I use KBS Klean for all kinds of projects around the house ... I recently found out that it works really well for cleaning out my shower and tub. I gave the welds a good scrub and just wiped the rest down with a rag dipped in my KBS Klean solution. 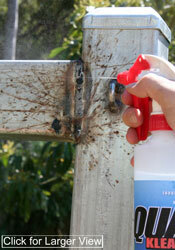 I then gave the whole thing a good spray with the hose. The whole cleaning process took no more than 5 minutes. You can see the weld is much cleaner but it still has weld scale on it. We do not want to paint over this or you will get the same result as the neighbor. 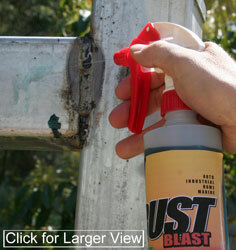 Now spray on a little RustBlast and keep it wet with the RustBlast for about 30 minutes. Look ... no more scale! The RustBlast is also ideal for etching the galvanized surface and it does this very quickly, you only need to leave the RustBlast on for 30 minutes (you can see it working as the galvanizing changes color slightly). Again, put the hose into service with a quick rinse down. All I had to do now was let it dry (I like this part because that means lunch time!). Then I mixed up a little RustSeal grey I had and spot primed the welds only, then followed with 2 coats of RustSeal over the whole thing. This gives me three coats on the welds which is a must and two coat on the plain galvanizing which is fine and then a solid color topcoat. I just used a water based house paint to match the house. An oil based topcoat would have been better (but I couldn’t get a color match in a oil based product) but because I have the RustSeal underneath it will be fine. Here is a Howie thought ... if you are using water based latex paints in metal or corrosion protection it is always a good idea to make sure you use high quantity primer system underneath as water based latex type paints have little if any ability in corrosion protection. Just ask my neighbor!